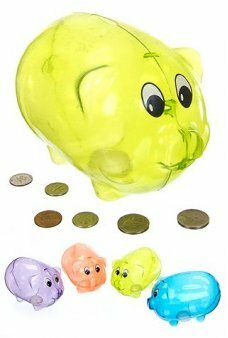 Piggy bank toys are so much fun for kids because they create something to look forward to each time they drop loose change in the top slot. At some point, there will be enough money in their piggy banks to be able to order a new toy from Tin Toy Arcade. It’s the perfect situation! 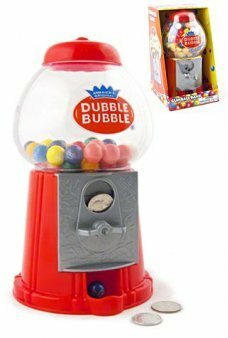 At Tin Toy Arcade, we specialize in vintage, retro, and classic toys that are faithful representations of toys from the 1950’s, 60’s, 70’s, and beyond! 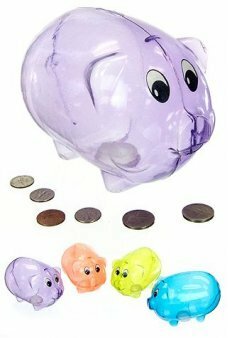 Choose from pig-shaped “piggy banks” to unique options that are creative and cool. 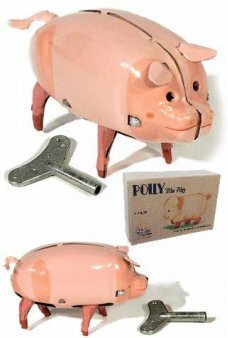 We offer plastic piggy banks, ceramic piggy banks, and even metal piggy banks for sale. You can order a piggy bank to use at home or at the office, or keep one on hand during fundraisers as a conversation piece. The choice is yours – so order today and get ready to save up some cash, one coin at a time! Our cute Pudgey is “Some Piglet!” Pudgey walks, oinks, wags his tail and really wiggles his pink nose! 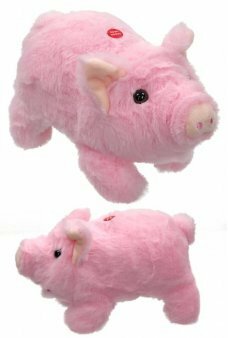 The large and sof..
Like the toys in the toy shop in Scorsese’s wonderful 2011 film, Hugo - Our happy pink pig walks on all four legs with r.. 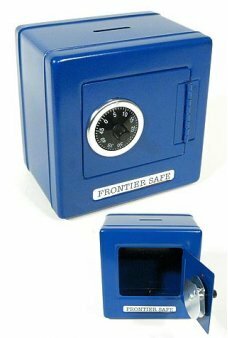 The classic Metal Combination Safe. Drop coins and folded money into the top or place valuables inside the locked door. ..
Fido the dog hides your coins! 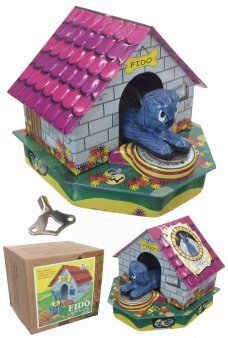 Just place a coin on your doggy’s round bowl and Fido will reach out of his dog house sli.. The dog ate my lunch money! Just place a coin on your doggy’s red bowl and push the metal button. Suddenly, your golden .. Put your valuables in our 11 Inches Tall High School Locker. 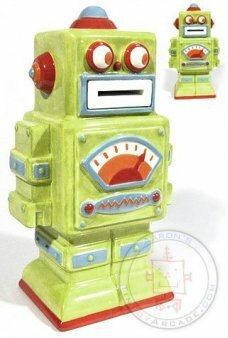 Secure your black Locking Box with real lock including 2 me..
Design and paint your own ceramic Robot Bank! 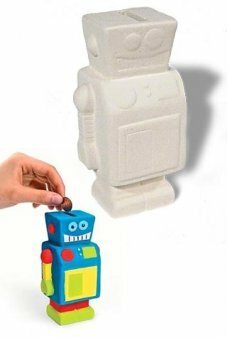 Our large Robot Bank is white ceramic, ready for your creativity. 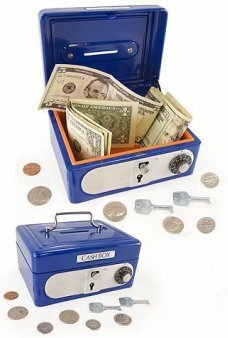 We recom..
A classic toy cash box. 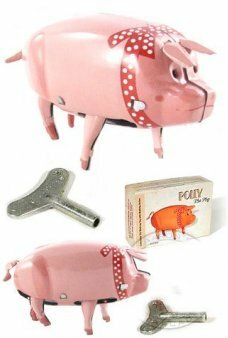 Our shiny black solid metal Cash Box features a coin slot, handle and both a key lock and combi..
Our happy pink pig Polly walks on all four legs with realistic and excited motion. Just wind up Polly and she roams arou.. 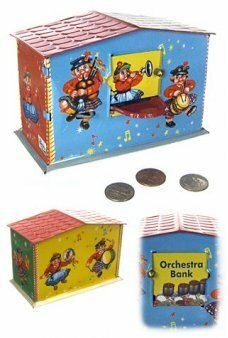 The Orchestra Savings Bank: a vintage disappearing coin bank! Just place a coin on your the red desk and push the metal ..
Our cute Three LIttle Pigs clickers make some noise to surprise the Big Bad Wolf. 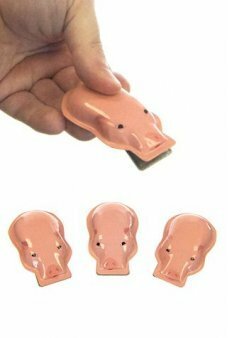 Just squeeze the little pig’s head to ..
Our cute Piggy helps you find your door lock in the dark while he holds your keys! Push the button on his head and the s..
A classic toy cash box. 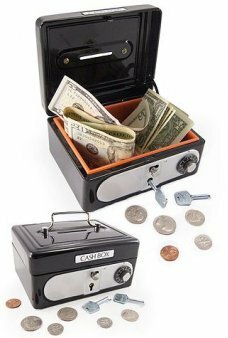 Our shiny blue solid metal Cash Box features a coin slot, handle and both a key lock and combin..
A penny saved is a penny earned! Here is a clear purple Piggy who wants to hold your coins. Just put your coins in the s.. 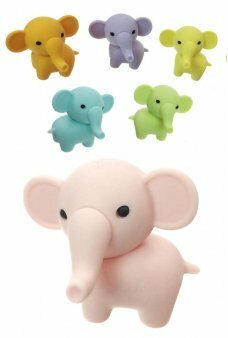 The cutest windup toy! Our adorable pink Piggy rides his blue Pony. 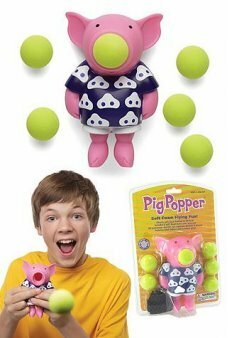 The little Pig shifts his weight to rock back and fo..
A penny saved is a penny earned! Our bright yellow Piggy wants to hold your coins. Just put your coins in the slot on hi.. 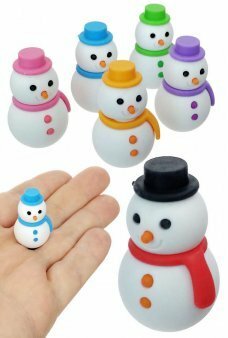 The cutest windup toy! 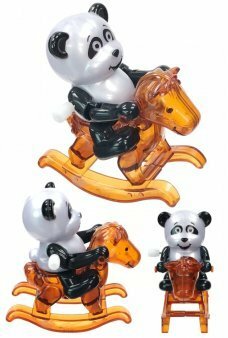 Our adorable white and black Panda Bear rides his brown pony. 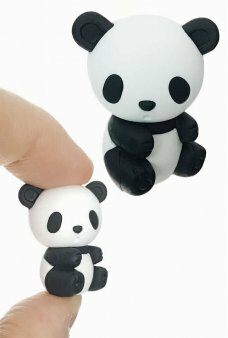 Rosalee the rocking panda bear shif.. 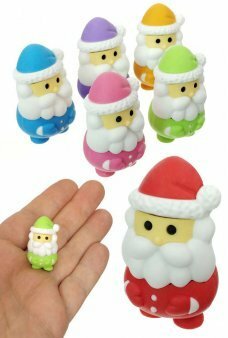 The cutest windup toy! 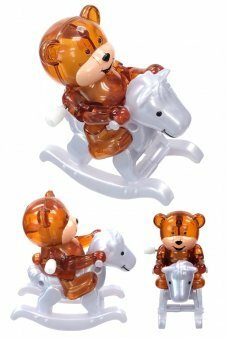 Our adorable brown Teddy Bear rides his white Pony. Ricky the rocking little bear shifts his weig..
What a fun circus wagon and bank! Our Silly Circus Bank features 2 keys and a working lock. 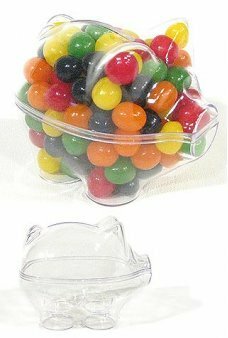 Drop coins into the tin top..